Transferring your data to a PC or Mac first has the advantage that your data is backed up on the computer; but connecting the old phone to the new one by cable is easiest. That said, the more manual method can save space, as you can decide individually on which photos, videos or music to move over to the new phone. It’s not always possible to transfer everything. For example, WhatsApp chats backed up on iOS are not compatible with Android, so you can only transfer conversations with additional software and effort. The same is true if you’re making the opposite move: WhatsApp messages will not be saved during the transfer to iOS, but your account will remain intact. Those who completely turn their backs on the Apple world should remember to deactivate iMessage, Spier says. Otherwise, these messages might not reach the new phone. Similarly, users should cancel any subscriptions set up on their old smartphone and make sure to log in on the new device. Of course, you might also be going from Android to iOS, in which case the App Store offers an app called Move To iOS. 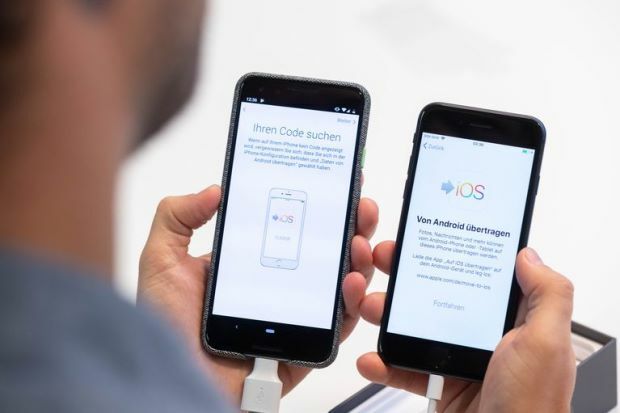 However, users should be aware that the iPhone you are switching to must be “new or reset”, according to reporter Blasius Kawalkowski. When moving to iOS, you should also make sure you have enough storage on the new iPhone, as these devices do not support SD cards, unlike Android phones. Therefore, it might be worth doing a good purge of unnecessary things, or backing up to your computer. Move To iOS transfers contacts, messages, pictures, videos, bookmarks, email accounts and calendar entries. And the app also automatically searches for iOS versions of the apps on your old phone. However, if you have paid for certain apps, you will have to pay again for the new iOS version. If the app in question was especially expensive, you can always contact the developer and ask if they can help you out. Remember to switch on flight mode on the devices during the transfer – if someone tries to call you during the process, it is stopped automatically, and you’ll have to start over.